Greetings! I had a look at previous topics, but sadly, couldn't find an answer for my question, so I'm sorry if this is a repost. The violin is the third instrument I'm learning to play. Due to my previous experience with the classical guitar, my fretting (left) hand is well developed and made my transition to the violin a lot easier. The issue I'm having is playing a perfect fourth interval either up or down , e.g. THIS sheet begins with an E, which is then followed by an A. I thought that playing the E on the G string might be a workaround, but couldn't be sure enough, as it is a long distance between A and E, and I don't think it optimal to perform in this fashion. In videos, where violinists play the respective reel, I don't see them reaching that high on the neck. Am I meant to apply pressure on both strings with my index finger? Should I change finger positioning? Or is there some trick to it? Any advice would be greatly appreciated! I may not be understanding your question. An E to an A is not a big reach in first position. Could you please post a screenshot, scan, or take a picture of that passage and I'll tell you what is the easiest way to play it. Also, when you mention using your index finger on both strings you really through me off because the A would be played with a 4th finger in 1st pos. If you are referring to a 4th double stop you would use your 3rd finger on the G string and 2nd on the D if that is the octave you want. If you are playing the next E, A you would play 3rd pos E on the A with the 2nd and the A on the E with the 1st. There are tons of options but it's easiest if you show us the sheets. 1st finger D string followed by open A string? I am thrown off by the index finger on both strings. Again, thanks for the aid. OK. The vast majority of reels, jigs, hornpipes and the like are in either the the key of G or D, because those are very convenient keys for fast fiddle playing using open strings. Most all of them are played by the fiddle in first position only, with frequent and intentional use of open strings. One would not play these types of songs in anything other than first position if one wants it to 1. sound authentic, 2. play the tune very fast as these songs usually are (particularly reels). Look at the first measure of the 2nd part (A-E-A-C-A-E-A). This would be played on on the D and the A strings. One would never ever see a session player play any of those notes on the G string. If you want to learn celtic music, old time music or blue grass, learn to love the 1st position and stay there -- forever. Here it is, notice how it's played. If you want to learn celtic music, old time music or blue grass, learn to love the 1st position and stay there -- forever. LOL! This is the only music I play and I have no need to move positions. I feel like I need to learn other positions but the music just doesn't want me too. EDIT: The little girl's rolls are so nice! Hahhaha @Uzi, awesome. Clap, clap, clap. The fiddle (double reed instruments aside) is among the most difficult instruments to learn, initially, and will take some time to gain the proficiency required to make pleasing sounds. As in turkey hunting, the fiddle requires the 3 P's to have a successful outcome: Practice, Patience and Perseverance. For Celtic music the first thing to learn is the G scale and the D scale in first position. These are all the notes you'll need for 90% of all the music you'll see on The Session. Practice them until you have perfect intonation for all of these notes, because they are the ones you need for most of these songs. I see. Thank you, @Uzi, for the scales and info. Still, how would you suggest playing an E note, after which playing a quarter down to A? Am I supposed to apply pressure on 2 strings with a single finger or rather use two adjacent fingers and seperately press each string? The latter, I'd guess, is contrary to the chart, but for all I know, it might be an exception. Both methods seem strange to me, though, as you said, this is a hard instrument and seemingly, not completely intuitive, so in fear of developing the wrong habit, I can't decide for myself, hence my ridicule of a quesiton. Check out this: http://www.celticscores.com/sh.....owtail_Jig . To increase speed, you can hold down the B and E with your index finger while adding and lifting the finger to play Gs and not play G when needed. There are also times that you can hold down your index finger and play a group of notes - it helps you keep your place. That was the confusion. If you play from E to A it can only be a fourth if you play up to the A. 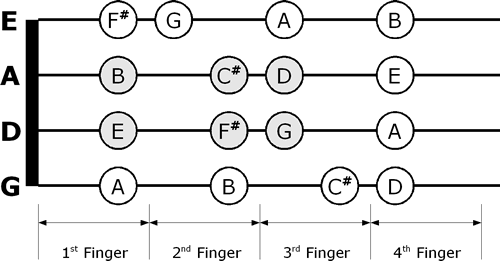 If you play from E down to A you are actually playing to a perfect fifth. 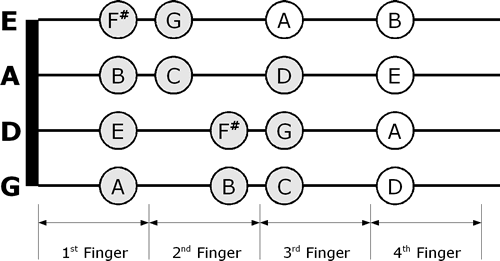 To play fifths you need to find the right part of your finger to be applying over both strings. You can also practice playing double stop fifths for practice.